Nearly 17 million people in United States struggle with an alcohol addiction.1 Even though alcohol is legal for people older than 21, an alcohol addiction can have serious, fatal consequences. Those with long-standing alcohol dependencies—individuals who have developed tolerance to its effects and who are likely to experience withdrawal in its absence2—may be at particular risk, as the process of acute alcohol withdrawal can be severe, if not lethal. Because everyone’s body chemistry composition differs, it is essentially impossible to predict who will develop these potentially physically dangerous withdrawal symptoms and who will not.3,4,5 So any person with an alcohol addiction, or who suspects they are abusing alcohol, should consult a physician before trying to quit. The symptoms of alcohol withdrawal usually begin to appear within 5 to 24 hours after the person consumes their last drink. Chronic drinkers generally have high blood alcohol levels when they start this process, so their withdrawal symptoms may surface a little later than this timeframe when the blood alcohol levels eventually drop. Initially, people withdrawing from alcohol may feel restless, irritable, and agitated. They often become argumentative, which may cause them to snap at those trying to help them, including their caregivers and treatment specialists. However, the alcohol addiction treatment professionals overseeing the withdrawal process know that agitation and irritation are normal, and generally are not offended. As the withdrawal process continues, users may experience nausea, sensitivity to sound, and impaired judgment. During this phase, it is important for people to get around-the-clock, medically supervised treatment to ensure their safety if they develop dangerous symptoms. Some of these more intense alcohol detox and withdrawal symptoms include seizures, spiking temperatures, and hallucinations. In most cases, vigilant medical supervision and appropriate seizure prophylaxis (preventive doses of sedative medications) should be used to minimize the risks of this life-threatening outcome. In the case of fevers and hallucination, the attending healthcare professional can decide whether or not medication will help ease these uncomfortable and sometimes-frightening detoxification symptoms. All of these symptoms may fluctuate in severity throughout the treatment process, further underscoring the need for close supervision. An inpatient detox program allows physicians and other treatment professionals to monitor your withdrawal symptoms and progress on a 24-hour basis. People who are not at risk to develop seizures may consider an outpatient withdrawal management program as well. Inpatient detox can cost between $600 and $1,000 per day depending on the program and level of care required by the addiction severity.6 These programs provide the best level of care for recovering from alcohol addiction, which can be a deadly process. Benzodiazepines: These drugs are considered the first line of treatment for alcohol withdrawal. They were developed to reduce anxiety but also are very useful in addressing the irritability, agitation, and most importantly, the seizures associated with alcohol withdrawal. These medications include Librium, Klonopin, Valium, and Ativan. Physicians administer these medications to people in withdrawal from alcohol, then subsequently taper down the dose at specific intervals to wean the person off of them. Baclofen: This drug is a muscle relaxant that can reduce cravings for alcohol in people in alcohol detox treatment. It is sometimes given during the withdrawal process. Antabuse: While normally not used during the withdrawal management process, this drug is sometimes used in people who have had multiple relapses or for people in outpatient withdrawal management programs. People using this drug have a severe reaction to drinking alcohol in which they become violently ill. This drug helps to deter any potential relapse, however, people who use it on an outpatient basis often simply stop taking the drug and drink alcohol without severe consequences (typically within 48 to 72 hours of discontinuation). Clonidine: This antihypertensive medication is sometimes used as an adjunct treatment to minimize some of the unpleasant symptoms experienced during acute alcohol withdrawal. Beta blockers: These drugs can be useful in controlling withdrawal issues with blood pressure. Others: Depending on the person’s presentation, other drugs may be used to address specific symptoms. Once the person has completed the withdrawal management program, they need to become involved in the long-term treatment program to address the issues associated with their substance use disorder. 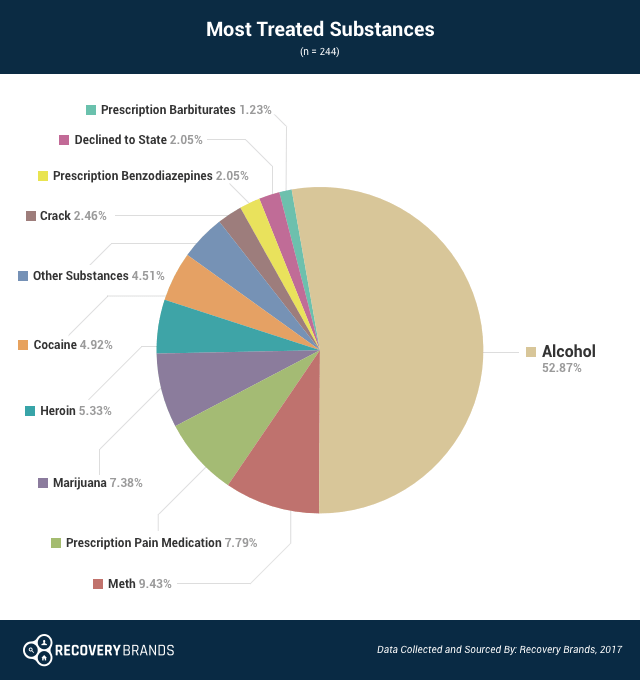 Alcohol, or ethanol, is abused at the highest rate among those who attend treatment, according to a 2017 Recovery Brands survey. Nearly 70% of survey respondents received treatment for a drinking problem, and almost 53% of people cited alcohol as the substance that they received the most treatment for. Despite receiving treatment for numerous other substances, the most troublesome one is alcohol. Fortunately, these days, treatment for alcohol abuse is widely available. Therapy designed to address the person’s core issues that fostered their alcohol abuse; help the person understand and analyze them; and develop compensatory strategies to deal with them. People in therapy also learn specific coping skills for stress and other triggers, psychological or psychiatric disorders, and develop relapse prevention skills. Family involvement in alcohol addiction treatment is a necessity, unless otherwise indicated a further danger to the person in treatment. One goal is to get family members on the same page as the recovering person so they can better assist the person in the recovery process. This can be accomplished through family therapy or having the person interact with family members in a constructive manner, such as through family activities, projects, community activities, and 12-step groups. Family members also need information about alcohol addictions since they often carry a number of misconceptions about it. Family therapy and Al-Anon groups are excellent ways to educate them. Attendance at 12-step groups or other community support groups for alcohol use disorders is extremely helpful. Being involved in a group such as Alcoholics Anonymous allows the person to develop a strong social support system with other recovering people, attend meetings whenever necessary, and even get involved in helping others with stay in recovery from alcohol addiction. Other interventions as appropriate to the person’s specific case, such as the treatment of medical conditions or other psychological disorders (e.g., depression), vocational rehabilitation, educational assistance, and occupational therapy. Completing a withdrawal management program is an important hurdle to overcome, but only the first step in the long term recovery from alcohol use disorder. National Institute on Drug Abuse. (2015). Trends & Statistics. American Psychiatric Association. Diagnostic and Statistical Manual of Mental Disorders (5th Ed.). Arlington, VA: American Psychiatric Publishing. Doweiko, H. (2014). Concepts of Chemical Dependency. Stanford, CT: Nelson Education. Bayard, M., Mcintyre, J., Hill, K. R. & Woodside Jr., J. (2004). Alcohol withdrawal syndrome. American Family Physician, 69(6) 1443–1450.